Naypyitaw -- After decades of struggle, hundreds of lawmakers from Aung San Suu Kyi's camp will form Myanmar's ruling party on Monday, with enough seats in parliament to choose the first democratically elected government since the military took power in 1962. The National League for Democracy (NLD) won some 80 percent of elected seats in November's historic vote, but the junta-drafted constitution means it will have to share power with the army that for years has suppressed, often brutally, the Nobel Peace Prize laureate and her allies. The first sitting of the NLD-dominated parliament is another step in Myanmar's drawn-out transition which started with the election and will go on until the NLD government officially starts its term in April. "We are likely to announce the president in the second week of February," said Win Htein, a senior member of the party. Other NLD officials said the presidential nomination process may begin towards the end of the month. This week, the party will focus on appointing parliamentary speakers, who were announced last week. It will also prepare for the start of state and regional assemblies on Feb.8, some in places dominated by large ethnic minorities such as Shan State in the east or Rakhine in the west. Each of the parliament's two chambers will appoint its presidential candidate and the military officials who hold a quarter of seats will put forward their nominee. Combined chambers will then vote on the candidates. The winner will become president. The other two will serve as vice presidents. Expectations are towering for Suu Kyi, who spent 15 years under house arrest after the NLD swept to power in 1990 but was barred from taking office, and is regarded with an almost religious-like zeal in the Southeast Asian nation. Myanmar's 51.5 million people expect the NLD to quickly fix everything from bringing peace to fracted ethnic states to stopping the abuse of the Rohingya Muslims in Rakhine by the Buddhist majority. "They (people) hope that every problem will be solved automatically after the NLD becomes the government, FDI will come in," said Shwe Mann, the outgoing speaker of parliament who is close to Suu Kyi, referring to foreign investment. But under the 2008 constitution, Suu Kyi is barred from becoming president because her children are not Myanmar citizens. 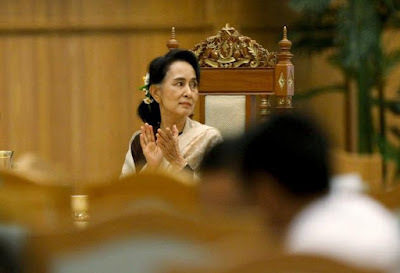 She has given no indication as to who will take over from outgoing President Thein Sein and the NLD has no clear number two. Suu Kyi has said she will be "above the president", and in complete control of the government, but the NLD has not explained how she will do this. "To accomplish the challenges, they need to choose the right people and put them in right positions," said Shwe Mann. "This is also my main concern, because it will decide the performance of her government."